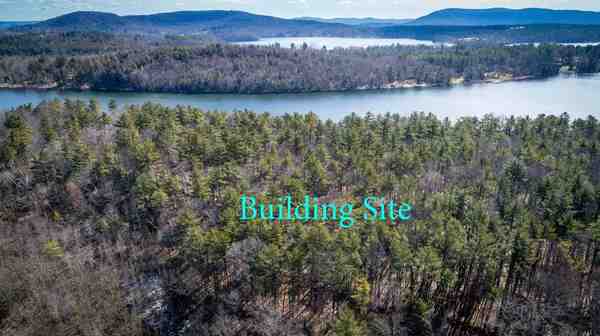 TWIN LAKES BUILDING SITE .....LAKE VIEWS AND DIRECT WATERFRONT ....13 acres on Taconic Road in Salisbury with 908 feet on the smaller of Salisbury's beautiful Twin Lakes. Driveway is roughed in which brings you past beautiful rock formations up to the building site which has been partially cleared and successfully perced for a septic system. Very quiet and private. Not subdividable. Lovely Classic Country Colonial. Beautifully updated kitchen with high end appliances, and granite countertops. The living room has a wood burning fireplace that opens to a sun filled dining area with views of private gardens. The Library has custom built bookshelves. Master bedroom is en-suite on the main floor with french doors to deck with pergola. 2 bedrooms upstairs with full bath. Downstairs, there is another en-suite bedroom and a finished family room. Professionally landscaped with irrigation system and fountain. Two car garage is attached through a breezeway. It is a short walk to the Great Falls on the Housatonic River and the Appalachian Trail. Close to area private schools, The Hotchkiss School, Salisbury School and Indian Mountain School. MetroNorth at Wassaic is about a 30 minute drive. This property is also available for rent for the academic year at 2,500 per month. Lightly furnished. HOUSATONIC HAVEN Whether a river enthusiast or you just want to watch the world float by, this beautifully renovated two-bedroom, two-bath contemporary cottage makes the most of its location on the bank of the Housatonic. River views from every room, open living/dining area with fieldstone fireplace, screened porch, gourmet kitchen, spacious master suite with whirlpool bubble tub/over-sized shower, are just a few of the amenities that make this the perfect weekend getaway or comfortably efficient full-time home. Hickory wood floors throughout; central air, generator. Newly renovated from the ground up! Wonderful home with 4 bedrooms and 4 baths in the main house, all en-suite with tiled bathrooms. Bed and Breakfast permit in place. Central air on the first floor. Large third floor playroom/craft room/ man cave with w/w berber and natural cedar paneling-cable ready. Level backyard with expansive decking/ramp/stream. Professionally landscaped with a fire pit, perennial gardens, and garden shed in the back yard. The 900 square foot attached, approved for retail/home office/ potential in-law apartment has it's own full bath, loft bedroom, kitchenette and living room, with cathedral ceiling. The retail/in-law/apartment/home office has it's own central heat and cooling system, front and rear entranceds with private parking. Dry basement with exterior bilco for storage, with sanidry system. Move right into this recently-renovated 1950 Cape which still retains its original cozy charm. New septic, roof, first-floor master suite, complete electric upgrade are just some of the improvements made to this 4 bedroom, 3 bath home on tree-lined residential street. Field stone fireplace, wood floors throughout and spacious front yard patio complete this inviting home. The almost two-acre property includes an adjacent wooded lot and is a short stroll to town amenities. Perfect for full timers or weekenders! EASY LIVING IN LAKEVILLE VILLAGE.....located on a quiet side street this charming house was completely renovated in 2010. Bright and sunny, there is an open floor plan, gourmet kitchen, wood flooring and a first floor master suite with luxurious bath plus a guest suite with full bath on the second floor. The large yard is nicely fenced and very private. Walk to Lakeville Lake and several restaurants. Detached one car garage. Town water and sewer.